I have a distinct memory of me sitting in my summer whites, my uniform as a conscript in the Argentine Navy in 1966. 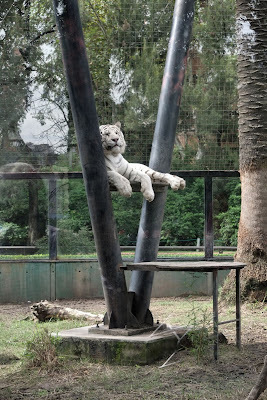 I was sitting on a bench of the Buenos Aires Zoo in front of the tiger cage. I was reading a copy of Time Magazine. I remember reading the body count for that week in Vietnam and reading how many Russian-made MiGs American Phantoms jets had shot down. I was there relaxing in one of my favourite places of Buenos Aires, the tiger cage. My father had often taken me in my youth and I always asked to see the elephants and the tigers. I did not like the lions. I thought that dogs and lions were related while the more exciting tigers and cats were of the same family. 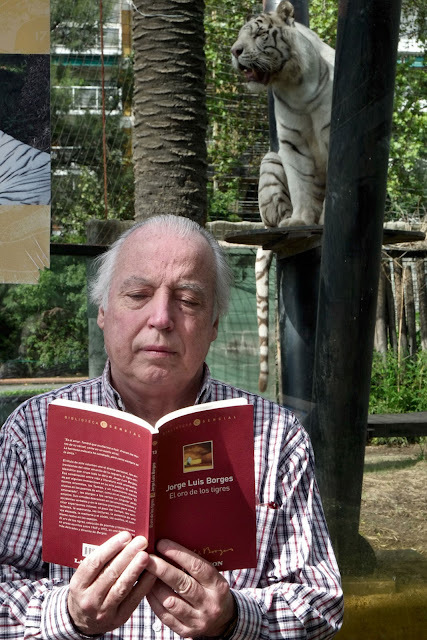 It is only at a later stage of my life, one in which I seem to read one Jorge Luís poem or story many times a week that I have come to know that Borges, too, loved tigers and disdained lions. Ha encendido los sueños de los hombres. Las manos de Sansón lo despedazan. Grutas custodia el oro de la sombra. Es uno de los símbolos de Shakespeare. Y lo coronan rey sobre los otros. Y en alto la cabeza extraordinaria. Y las mitologías lo prodigan. Come la presa que le trae la hembra. Like the prey (a hyena perhaps?) his female mate brings to him. While taking the subway (the subte is how Argentines call it) in my trip to Buenos Aires a few weeks ago I stopped at the Tribunales Station (Law Courts) on my way to visit my friend, painter Juan Manuel Sanchez in his studio on Paraguay and Talcahuano. 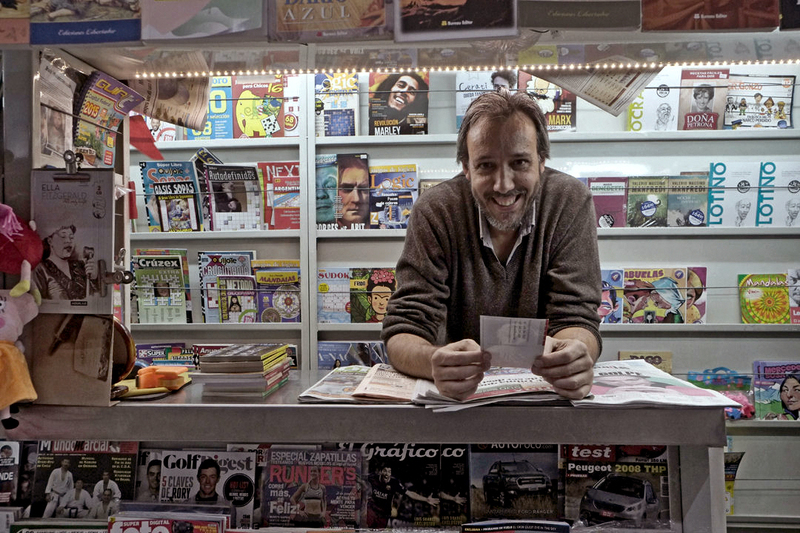 For years (since I can remember) one has been able to buy not only magazines but good books in any Subte station kiosks. 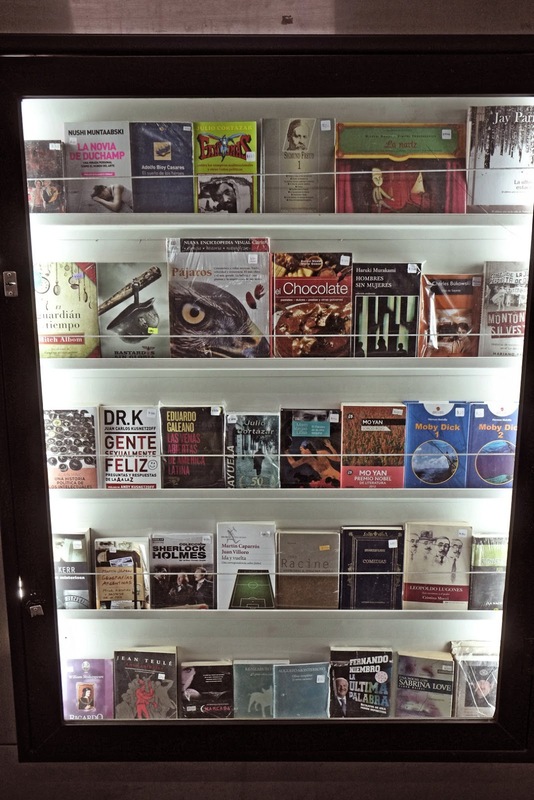 This particular kiosk had a book, surrounded by a marvelous and eclectic neighbours, that immediately stood out. I chatted with the man who ran it. He is called Carlos Perez, and yes, most appropriately he is a lawyer. 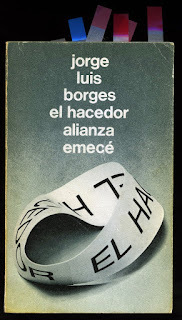 Since I have Jorge Luís Borges’s complete poetic output I was slightly confused by a book that I saw behind the glass window. I was familiar with the poem called El Oro de Los Tigres. Borges had written it in East Lansing, Michigan, home of Michigan State University where he was conducting a series of lectures. I finally got the gist of this particular selection. The title is not only about the colour of the Bengal Tiger but is also about yellow, the last colour that Borges was able to discern by that year, 1972r when he was going blind. 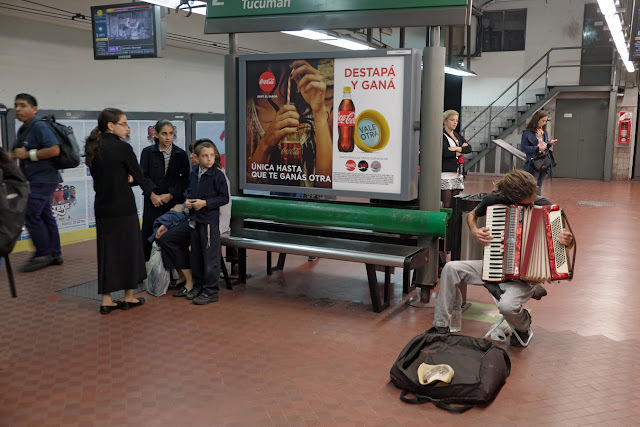 So, on that Tribunales Subte platform it finally hit home that since both Borges and I had been fascinated by the Bengal Tigers of the Buenos Aires Zoo I had to pursue the subject for a blog. There was some confusion in my task as many told me that the zoo was being closed and that the tigers were gone. This was not the case but it is a fact that the zoo is going to be closed and it’s all hush-hush what the city government is going to do with the very valuable property. 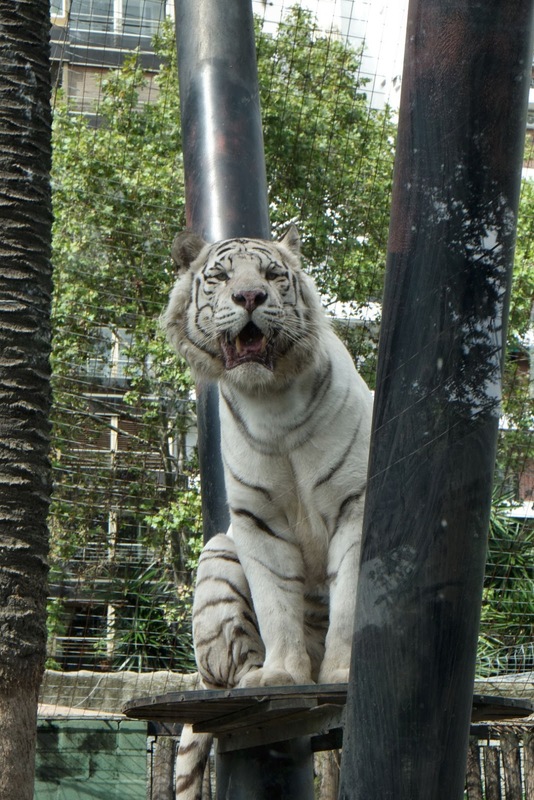 I was told the tigers (alas not yellow but very white!) were going to be moved to a town near the resort city of Mar del Plata called Batán. I drafted my friend Roberto Baschetti who works at the National Library to pose for me with the Borges book. All we needed was to find a tiger. It seems that the tiger was indeed waiting for us as he posed for the shot. I will translate the first six lines. 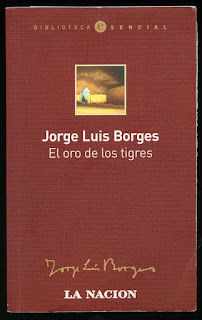 The this way that way walk of the tiger behind bars Borges wrote at least twice before and in one of the poems it was about a panther. without suspecting that they were his jail. There were no golden Bengal Tigers to be found. 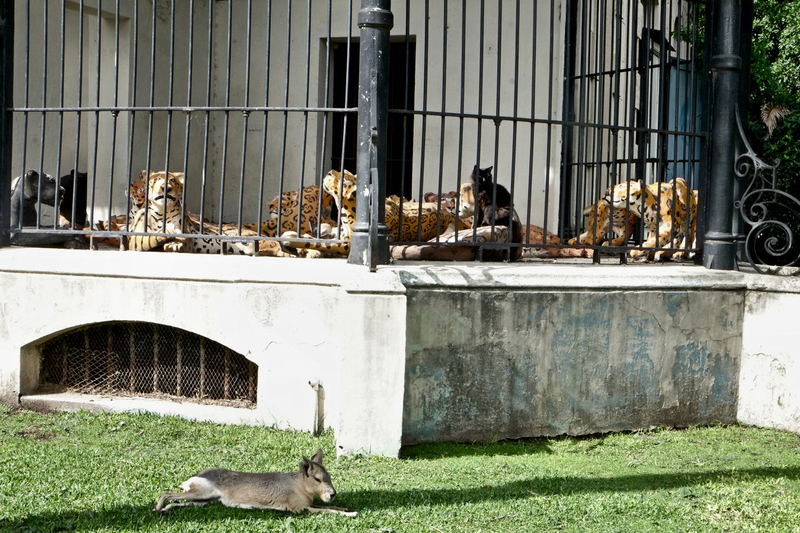 The closest were hundreds of papier mâché jaguaretés (South American jaguars) behind bars sunning themselves. 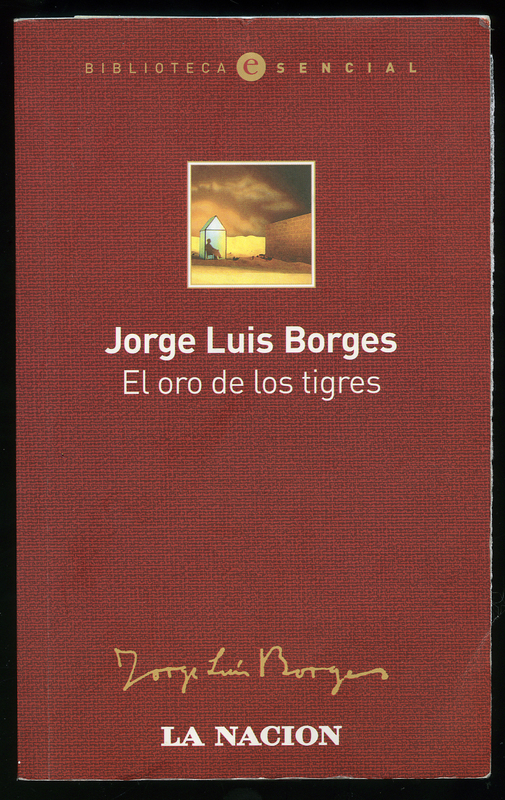 Below you will find the Borges essay Dreamtigers which always had its title in English. Note how Borges depricates the South American jaguar as seen bellow! 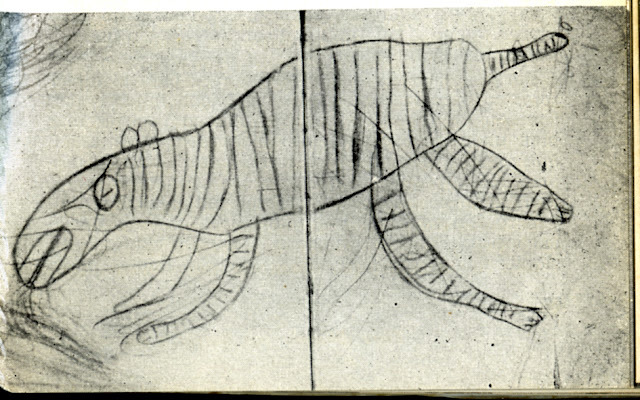 En la infancia yo ejercí con fervor la adoración del tigre: no el tigre overo de los camalotes del Paraná y de la confusión amazónica, sino el tigre rayado, asiático, real, que sólo pueden afrontar los hombres de guerra, sobre un castillo encima de un elefante. Yo solía demorarme sin fin ante una de las jaulas en el Zoológico; yo apreciaba las vastas enciclopedias y los libros de historia natural, por el esplendor de sus tigres. (Todavía me acuerdo de esas figuras: yo que no puedo recordar sin error la frente o la sonrisa de una mujer.) Pasó la infancia, caducaron los tigres y su pasión, pero tadavía están en mis sueños. En esa napa sumergida o caótica siguen prevaleciendo y así: Dormido, me distrae un sueño cualquiera y de pronto sé que es un sueño. Suelo pensar entonces: Éste es un sueño, una pura invención de mi voluntad, y ya que tengo un ilimitado poder, voy a causar un tigre. In my childhood I was a fervent worshiper of the tiger: not the jaguar, the spotted “tiger” of the Amazonian tangles and the isles of vegetation that float down the Paraná, but that striped, Asiatic, royal tiger, that can only be faced by a man of war, on a castle atop an elephant. I used to linger endlessly before one of the cages at the zoo; I judged vast encyclopedias and books of natural history by the splendor of their tigers. (I still remember those illustrations: I who cannot rightly recall the brow or the smile of a woman.) Childhood passed away, and the tigers and my passion for them grew old, but still they are in my dreams. At that submerged or chaotic level they keep prevailing. And so, as I sleep, some dream beguiles me, and suddenly I know I am dreaming. Then I think: this is a dream, a pure diversion of my will; and now that I have unlimited power, I am going to cause a tiger.